Tell me if I’m wrong? The Christmas spirit has gone. The sound of auld lang syne has long stopped reverberating in the eardrums. The seed catalogues are now your new best friend? There is inspiration to be gleaned from the seed catalogues. However, it also poses a dilemma. There are currently 5,676 available films and TV series on Netflix. When Hannah and I decide to watch a film, we usually spend the next 45 minutes trying to choose one. More often than not, we give up on the idea. Now, I’m not against the level of choice presented to us in the seed catalogues. I think it’s an example of how the incredible variety of crops available to grow at home demonstrates how appealing and beneficial growing your own fruit and vegetables can be. However, when in most cases, limited space and our available time is a barrier to growing everything in the dam book, the solution is simply placing a level of constraint on the choices in front of us. There are numerous ways we could do this. For me, I often seek inspiration from other people. This limits my decisions but adds the benefit of real stories, from real allotment and kitchen gardeners. Luckily for us, the online gardening community is packed with people willingly providing such inspiration from their experiences. I’m also grateful to call many of them my friends too. I put out a call to 11 Grow Your Own Fanatics from within the big garden in cyberspace (ok Instagram) and asked them one simple question: What is your must grow vegetable in 2019? I also asked them to be a little more specific and name the variety of that vegetable too. Man, you should have seen them squirm. Turns out, when you are obsessed with growing your own veg, picking just one isn’t that simple at all! I persisted. I felt cruel, yes, but I won’t lie and tell you that wasn’t part of my fun either! The wonderful lot gave me what I asked and I want to share their pearls of wisdom with you. “There’s no denying it, I like my food spicy. Chillies end up in so many of my homegrown recipes, but if I’m faced with a glut, I love the challenge of preserving them in different ways. You can dry them, freeze them, stick em in a stew, or make spicy oils, chutneys, sticky sauces, tomato sauces, and even Christmas decorations! Follow Katrina on Instagram and YouTube. ‘Like most growers, there are certain fruits and vegetables I enjoy growing on our allotment year after year. Top of my ‘Must Grow’ fruit & veg list have to be pumpkins. I love growing pumpkins because they’re perfect for our children to get involved with. They’re really easy to grow, they have absolutely huge seeds making them easy for children to handle and after a few months, they have something they can carve and decorate for Halloween that they’ve grown themselves from seed. “My must-grow vegetable is pumpkins! A huge part of why I love growing my own is the variety and range of options available to a gardener which you will never see in the supermarket and the vegetable that shows this best for me is pumpkins (AKA winter squash!). You might think of a pumpkin as a tasteless orange sphere only suitable to be made into a Jack O Lantern or Cinderella’s carriage. But when you grow them from seed there are hundreds of possibilities. Different shapes, colours, sizes. From the tiny individual-serving size ‘Jack Be Little’ to the vast competition-winning ‘Pacific Giant’. You might grow Italian Tromboncino that grows into wiggly crazy shapes like trombones, French Galeuse d’Eysines with its beautiful warty bloom or culinary marvel Anna Swartz Hubbard, with its thick skin for long storing and delicious sweet dense flesh. “Swiss chard was one of the first things I grew on plot 15c and now it’s one of my favourite things to grow, I couldn’t be without it! Over the past five years, I’ve learnt that it’s best sown in seed module trays in July to be planted out in August once the potatoes have been harvested. Leafy greens tend to bolt during the hot weather and I find it’s easier to manage later in the season, plus it’s extremely hardy and will even survive snow! The leaves are cut and come again so my 3 rows of chard will keep me going until next Spring. The leaves and stalks can be added to stews, casseroles, omelettes and even salads, however, my favourite thing to make with swiss chard is a quiche and we often make plenty to freeze and enjoy in the Winter. “If I was forced to only grow one thing to eat it would be tomatoes. I have such happy memories from my childhood of going into the hot greenhouse and picking small cherry tomatoes off the vine. No shop bought tomato has ever come close to the taste of homegrown. I grow several varieties every year but always have cherry tomatoes, yellow and larger plum varieties. They are really simple to grow. We have a few in grow bags in the greenhouse and in raised beds outside. My favourite variety is the fantastically named ‘Japanese Black Trifele’ – it’s large, dark, sweet and fleshy. “Balmy summer evenings spent at the allotment aren’t complete without heading home armed with freshly-picked sweetcorn. In our house, it’s thrown straight into boiling water and smothered in salty butter before being devoured – and oh my, you just can’t beat it. Homegrown corn on the cobs are sweeter and tastier than anything you can buy in a shop, and that’s a perfect reason to grow them. Last year I got adventurous – growing a nutritious double red sweetcorn and some strawberry popping corn. While I enjoyed both, I really missed standard yellow sweetcorn. There’s a lot to be said for sticking to the basics sometimes! I love growing sweetcorn so when I found out I could grow my own corn for popping, it was a no brainer. I’m secretly a huge film geek so the thought of me being able to snack on homegrown popcorn during the cold winter months was ideal! I choose to grow “Strawberry Popcorn” from Victorian Nursery Gardens, which is a small variety and only grows to 4-5ft tall, with cobs growing to approximately 50mm. They are small but I got around 4-5 ears on each plant. 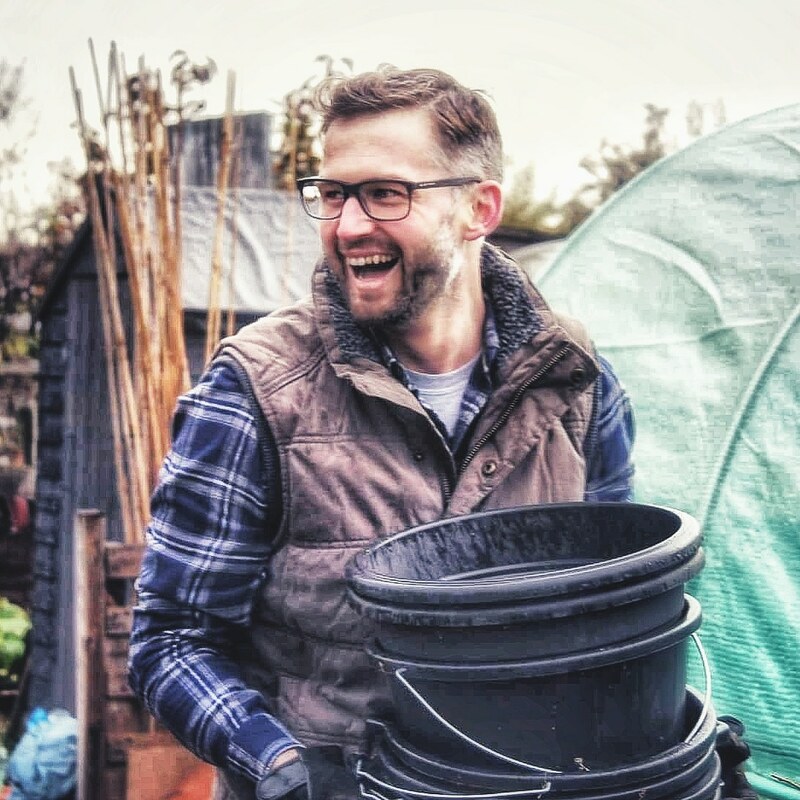 “When Richard asked me to choose my must grow vegetable for my allotment I was a bit stuck – there are loads! – but it made me realise that whenever I start jotting down crops for the year ahead, number one is always purple sprouting broccoli. One of my nicknames at uni was Broccoli for reasons unknown but let’s not dwell on that… I’m taken by how ridiculously beautiful the plant itself is as well as those mouthwatering spears in spring. If it weren’t for cabbage white butterflies destroying unprotected crops it would be in our exotic garden at home. Ultimately though, it’s the seasonal crop I look forward to picking the most because it is so sweet and delicious and usually easy to grow. “Picking a must grow vegetable to grow this season is pretty impossible when I’m growing about 100 different things on my allotment. I would normally say pumpkin and squash every time as they bring me so much joy, but that doesn’t mean other things don’t bring equivalent joy too! This vegetable is easy, quick growing, fun, colourful and comes in numerous varieties. Yes, it’s the good old radish, brightening up salads all summer long. This year I’m growing about 10 or more different types of radish and they all have slightly different colours, shape and taste. My all-time favourite radish to grow is the ‘Blue moon’ radish from Thompson and Morgan. The colour and pattern are exquisite, they have a lovely taste and are super easy to grow. “Thanks for the question Richard!! My must grow veg?? In a nutshell, the answer is any Vegetable, Herb or Flower I can get my hands on. But the question is: my must grow veg; without any hesitation, it has to be Chilli. And lots of different varieties I can lay my hands on. From the mildest pepper on the Scoville Scale to the million Scoville Chilli, after that I throw the towel in; I will not grow any spicier!! Wouldn’t it be funny if my reason were “couldn’t take that much heat”? You never know, if someone sends me their saved seed in the post, I may just grow them. Would be a shame to just store the seeds, wouldn’t it? My must grow Chilli is Pusa Jwala (20-30,000 SHU) and the one I am most proud of, as the seed is my own seed and now in the 5th generation. A Chilli, which is found in many Asian supermarkets, here, in its green form and used in many Asian curries. NO Indian (home) kitchen I know, wouldn’t have this Chilli in their Kitchen. They can be used Green or Red; fresh or dry. They are just sold as fresh chillies in Asian supermarkets. I noticed not a single Seed Catalogue here, sell this chilli seed. Remember this was 4 years ago. So reluctantly I bought the chilli, (4 years ago), from an Asian greengrocer, dried and chilli and saved the seeds, keeping my fingers crossed, they are open pollinated variety and not a hybrid. My joy to find flowers on these plants, and perfect chilli fruits. The rest, as they say, is history. Now I have even invested in a dehydrator and made my own Chilli Powder, enough to last me a whole year, all 340g of it. “As a food grower, I’m always on the look-out for vegetables that will keep me satisfied long after summer has finished. I’ve selected runner beans as my recommended vegetable for 2019 because, alongside pumpkins and hard-skinned squash, from a handful of seeds alone you can expect to harvest a very good crop. I really enjoyed growing the popular variety ‘Lady Di’ last year and used the string-less beans in a host of meals, including a delicious one-pot roast with herby tomatoes. Though mine were often left to their own devices, with well-fed soil and regular watering, the beans that you choose to grow have the potential to provide you with kilos of pods. I’m so grateful to this beautiful lot for scratching their head’s to decide their must grow vegetable in 2019. I feel very strongly about bigging up the wonderful gardening community that exists online. It has certainly opened up new inspiration, advice and friendships for me. I hope the stories above provide you with some inspiration on your allotment garden this year. I’d love to hear your favourite things to grow too. Drop me a comment below. Follow Sharpen Your Spades! You can receive my posts by email – Subscribe here. You can get in touch with me here. Connect with me on Twitter, Facebook and Instagram. Mine would have to be Broad Bean ‘Aquadulce Claudia’. There is just nothing like freshly podded broad beans in a pasta dish or blitzed for Bruschetta with mint, garlic, lemon, olive oil and parmesan. Food of the Gods. It is (not so) funny that you mentioned Netflix. The last horticultural crops I grew in the Santa Clara Valley were where the Mineta Highway (85) and the headquarters of Netflix are now. Anyway, if I has more limited space, I would still want to grow tomatoes. I do not know how I would do it without much space to rotate them. I suppose I would need to grow zucchini too, especially since I can not grow tomatoes in the same spot for two years. For spring and autumn, I would grow beets. Anything unusual, different colours, shapes and sizes of pumpkins and gourds! I’m in the first year of my new allotment at Craghead, near Stanley in County Durham. I’ve spent the past six months clearing and building raised beds, I’m only able to work for about 40 minutes at a time due to arthritis in all my joints. I got lots of onions and shallots planted out in October and most are doing well, I also have a few fruit bushes and some small apple trees. I’m still finishing off my potato plot and next week I’m off to the Durham Organic Garden Club to buy my potatoes. I’m also planning tomatoes, courgettes, carrots, cauli, cabbage, peas, runner beans, turnip and anything else I can bring on from seed, I enjoy reading the ideas from ‘Sharpen your spades’ and I’m sure I’ll attempt a few extras, a very inspirational web site to the returning gardener. Many years ago as a teacher I developed, ran with young people and produced loads of vegetables for the school and pupils. It only stopped after I got injured and had to leave teaching …. another story, that. It’s blueberries in the garden for me but this year with my new allotment I’m sure it will change. So nice to read experienced allotmenteers favourites. Sweet corn is now on my list (I already bought too many pumpkin seed varieties)! I'm Richard and I'm passionate about growing fruit and vegetables on our family allotment garden. Sharpen your Spades is a blog to inspire anyone to pull on their wellies and join in the movement to grow their own. I can't be the only one who gardens in their PJs. Right? How can you resist getting outside when the mornings are so blinkin beautiful at the moment. I'm starting to sow some more seeds now. It's been worthwhile easing off for a week or so. I've been able to manage the plants I currently have growing, get on with some preparation on the allotment and just simply take a breath and enjoy watching things grow quietly. Now I'm sowing squash, pumpkins and courgettes on heat (or at least inside on the windowsill). Same for sweet corn too. Some chard now. Leeks and I've also just sown some white zinnias 🌼 I've also popped in some more beetroot. Burpees Golden this time. Hoping for a relaxing, sunny end to the bank holiday weekend 🌞 . . . . .